What does Woodlaw n United offer for children? 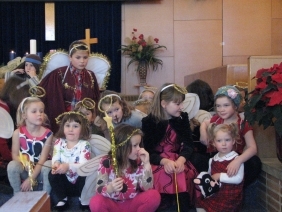 Each Sunday, following story time, the children go downstairs for Sunday School. We design a Sunday School curriculum based on the evidence surrounding children’s spirituality. It is called the Rotational Model and the children explore a theme for three weeks by visiting three different stations. The stations use a variety of learning styles to introduce the themes and scripture to the children through art, crafts, drama, cooking, science, storytelling and song. It also opens up new ways of inviting people into relationships with our children through a 3 week volunteer experience. • FAMILY ADVENT FUN called Bedlam in Bethlehem, where we learn the true meaning of Christmas. Fun for the whole family! 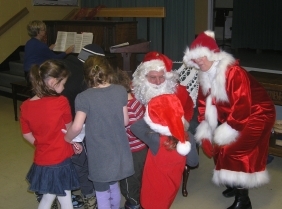 • The Youth Group runs a SANTA CLAUS BREAKFAST for the Sunday School in December. Pancakes & Santa Claus….. what else could you possibly want? • CONGREGATIONAL PICNIC at the end of the school year. 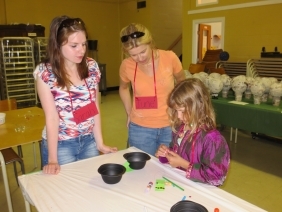 Mystery Friends Program: This program builds friendships that bridge the gap between generations. A younger member of the congregation is secretly paired to an older member and they become penpals for 6 weeks by using a secret code name. For 5 weeks, the pair writes letters to each other exchanging all sorts of interesting tidbits about themselves and on the 6th week they meet! Tween Tuesday: Grade 4 and 5 meet the first Tuesday of the month from 7 to 8 PM in the Youth Room of the White building. We do games, art, cooking, drama and science. And of course, we will talk about why church is important in the world... who Jesus was... and how we can have a relationship with God.